At long last, round two! We looked at the top ten stories from the Marvel (Comics) Universe’s first five years a few months ago, so let’s move on to the second five years. This entry was posted in comic books, Marvel Top Ten and tagged Archie Goodwin, Avengers, Fantastic Four, Iron Man, Jack Kirby, John Romita, Marvel, Roy Thomas, Spider-Man, Stan Lee on March 7, 2018 by drsherrier. Presenting, just for fun, Marvel Comics’ ten best stories from 1961-1965! So we begin at the dawn of the Marvel Universe. True, many books from this era don’t hold up particularly well, not to the adult reader. They are dated indeed. But in the foundation of each series are strong, enduring concepts and flawed but heroic characters that people of varied backgrounds can relate to. Plus, the old comics offer plenty of charm with their fast-paced displays of free-flowing imagination. Looking back on these early issues, it’s not hard to see why the characters have survived the decades. Let’s get to it. As Stan Lee would say, Face Front, True Believers! Make Mine Marvel! Excelsior! ’Nuff Said! The superhero genre has a simple but effective formula: The hero almost loses to the villain but ultimately prevails, often improving him or herself along the way. Doctor Octopus’s debut shows an early example of that formula in action, back when flawed superheroes were still a fresh idea. As the book opens, Spider-Man is feeling supremely confident in his crimefighting abilities, and he’s itching for a challenge. 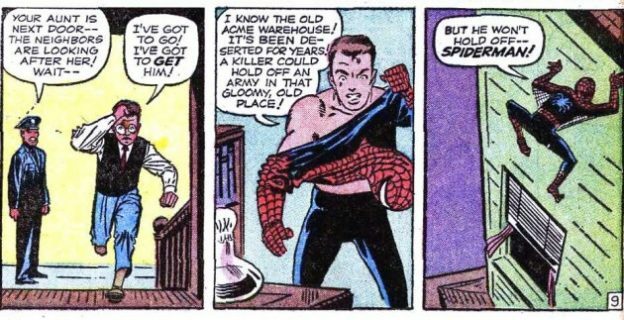 And he gets one, and he gets clobbered, leading Peter to wonder if he’s even cut out for this superhero lifestyle after all. So he’s got a choice: quit, or try again but do it better this time. Peter Parker is still growing into his role at this stage, and that’s part of what made this series so novel—the superhero was actually growing as a person. This entry was posted in comic books, Marvel Top Ten and tagged Daredevil, Doctor Octopus, Fantastic Four, Jack Kirby, Marvel, Namor, Spider-Man, Stan Lee, Steve Ditko, X-Men on October 22, 2017 by drsherrier. 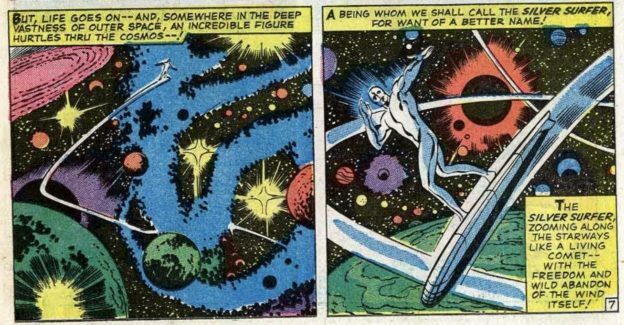 Marvel’s early Silver Age was in top form in the Fantastic Four’s first annual. The story, the FF’s longest-ever at the time, builds on elements previously established, such as the attraction between Namor and Sue Storm. Namor has finally found his Atlantean race, and they declare war on the surface world. What’s most interesting, and groundbreaking for the era, is how Namor meets his defeat. (I’m going to spoil the ending, but this story is 53 years old, so…) The FF don’t succeed in overpowering the Sub-Mariner, but when the Invisible Girl is seriously hurt, Namor drops everything to get her to a hospital. The Atlanteans see this as a betrayal and abandon him, leaving Namor ostracized both on land and in the sea. The issue represents what ‘60s Marvel was all about—epic action and big sci-fi ideas, all grounded in character. Sure, it’s dated, but it remains a fun time nevertheless because of the colorful characters inhabiting this imaginative world. This entry was posted in comic books, Today's Super Comic and tagged Fantastic Four, Invisible Woman, Jack Kirby, Marvel, Namor, Spider-Man, Stan Lee on November 11, 2016 by drsherrier. A classic slugfest, and the greatest Thing vs. Hulk battle ever put to four colors as the Stan Lee/Jack Kirby collaboration really begins to hit its stride. The Hulk is rampaging. The Human Torch and the Invisible Girl don’t have the raw strength to hold their own against him. Mr. Fantastic is out of commission with a mysterious flu. The Avengers haven’t arrived on the scene yet. That leaves the Thing as the only person in the city with any prayer of taking down the Hulk. As strong as the Thing is, though, he’s seriously out of his weight class here. But that doesn’t stop him from giving the Hulk everything he’s got. This entry was posted in comic books, Today's Super Comic and tagged Fantastic Four, Hulk, Jack Kirby, Marvel, Stan Lee, Thing on June 25, 2016 by drsherrier. This may be an old one, but it also holds up as among the finest Fantastic Four stories of all time. An unnamed scientist, who envies Reed Richards’s success, lures the self-pitying Thing into his apartment and steals his powers, reverting Ben Grimm to human form. Posing as the Thing, this scientist infiltrates the FF as Reed is trying create faster-than-light travel in his quest to build defenses against threats like Galactus (the world was almost eaten like yesterday). He’s preparing to embark on a one-man exploration of sub-space, but he’s depending on the Thing to keep him anchored to their own dimension. When Reed gets into trouble, this nameless scientist has a chance to show what kind of man he truly is. It’s a short but incredibly effective redemption tale during which not a single punch is thrown. If last year’s Fantastic Four movie left a bad taste in your mouth, rinse it out with this and observe the classic writer/artist team of Stan Lee and Jack Kirby in top form. This entry was posted in comic books, Today's Super Comic and tagged Fantastic Four, Jack Kirby, Marvel, Stan Lee on June 9, 2016 by drsherrier.